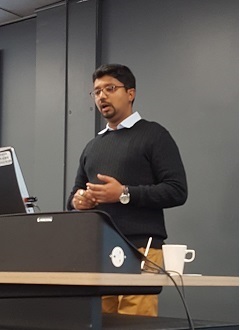 In late November 2017, Dr Nishikant Gupta visited the University of the West of England (UWE Bristol) to deliver lectures to postgraduate and undergraduate Integrated Water Management students, and also deliver a presentation for discussion at a staff seminar. Whilst in UWE, Dr Gupta also worked with members of the IWSN team to progress some papers and research proposals. Nishikant is currently working at the International Centre for Integrated Mountain Development (ICIMOD), Kathmandu, Nepal, but is also a Visiting Research Fellow within the Department of Geography and Environmental Management (DGEM) at UWE. Following brief introductions to both BSc and MSc classes by Dr Mark Everard on ecosystem services, setting a context for applied water management, Nishikant presented to each his talk: Water resource management challenges in the Himalayas: current trends and research needs. His presentation began by providing an overview of the Hindu Kush Himalayas (HKH), and the projected climate change trends (up to 2050) for the region. The talk then used the Brahmaputra river basin (one of the 10 major river basins of the region) as a case study, outlining existing and projected water resource management challenges in the wake of changing climatic variables in the basin. He concluded by identifying opportunities amidst the projected climate impacts, and how best to assist dependent communities (both within and downstream of the region) in adapting to the projected adverse impacts of climate change. Presentations in both classes were followed by lively question-and-answer sessions with students. Group work was also undertaken in which students considered and proposed potential steps that could be taken to address some of the challenges. Nishikant also gave a presentation to Departmental faculty members: Climate change adaptation policy response for the water sector in the Hindu Kush Himalayas. Again, he began with an overview of the HKH, and the projected climate change trends up to 2050, but focused on the impacts of climate change and associated risks for the region. The presentation turned to existing adaptation policy responses for the water sector, and the gaps which need urgent intervention/attention by policy-makers. He concluded with a discussion of current research needs for the sector, and how best to link biodiversity with the livelihoods and food security of the communities in the HKH. He then took questions from faculty members.